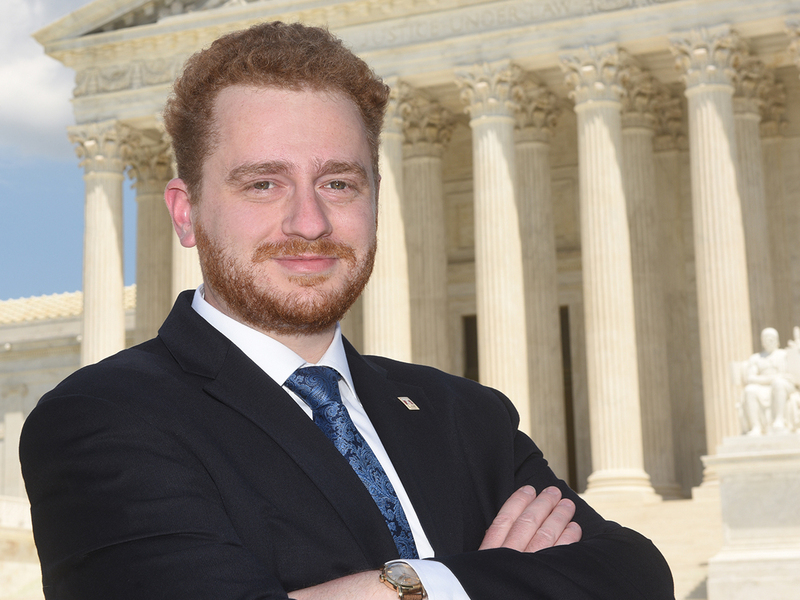 Jared Fink is a 2017 Law & Public Policy Scholar and a member of the Temple Law Class of 2019. I came to law school to work in public service. I wanted to learn how best our lawmakers can leverage economic and public policy tools to strengthen communities and make our society a little more equal. Big topics and lofty goals, I know. I still hold them today. I decided to come to Temple Law after a phone conversation I had with Professor Nancy Knauer on March 4, 2016. At that time, I was still debating which law school would be the best fit, considering competing programs, scholarships, location, and everything in between. Professor Knauer is the founder and director of the Law & Public Policy (LPP) Program at Temple Law, and it was this program that had attracted me to Temple. After a conversation lasting only a few minutes, I was sold. Professor Knauer outlined the structure of the program and highlighted accomplishments of past LPP Scholars. I relayed my lofty interests and career goals—which were self-affirming just to convey. When I finished, she paused and simply said, “Sounds great!” That validation was truly empowering. It still resonates with me today. In Winter 2016, after formal acceptance to the LPP Program, I came to understand further the practical benefit that Professor Knauer and the LPP Program would become. Not only was Professor Knauer was supportive of my goals, but as an advisor, she provided an array of practical advice and professional connections that continue to prove essential. One of the most important pieces of practical advice Professor Knauer gave our class was to remain flexible and open to new opportunities. To paraphrase: Think seriously about your values and the skills you want to use and curate—look for work that will align with those, and you will end up doing good, meaningful work, even if it is tangential to the path you set out for. Personally, I came to law school interested in education policy. That is because I value education intrinsically but am excited by the wide societal benefit quality education can bring a community. Flexibility in mind, however, I have found these values mirrored in many policy areas. For example, housing is necessary itself, but access to stable, affordable housing, is essential to the development of any community. As such, when Professor Knauer suggested I apply to intern at the Department of Housing and Urban Development (HUD) Office of General Counsel, Office for Legislation and Regulations during my 1L Summer, I jumped at the chance. Had I not been flexible to that opportunity when it was presented, my path through law school would have been quite different. At “Legs and Regs,” as it is called at HUD, I had the unique opportunity to draft federal legislation, regulations, and policy guidance, sit in on U.S. Senate hearings related to HUD, and to study a broad range of federal housing policy. That experience was invaluable. During the Summer, our LPP class met twice each week. We discussed a variety of legal issues and policy matters, ranging from gun control to the free exercise of religion and from climate change to affordable health care. Meeting as a group provided a great opportunity to discuss news, research ideas, or career interests—either with other Scholars or Professor Knauer. Though that Summer, I found that joining the LPP Program and this community of policy-minded people helped me find my place both at Temple Law and in the professional world. During LPP class meetings, Scholars also had the opportunity to present individual research projects to the class, getting feedback from peers and practicing public speaking. This benefit was key, for Scholars also present individual research at a symposium on Temple’s campus, and they are encouraged to submit their research to the Annual Meeting of the Law and Society Association (LSA), an international public policy conference with hundreds of speakers each year. Along with many fellow Scholars, I was honored to present my research on social cost of unjust eviction at LSA in Toronto, Summer 2018. The contacts I developed at the HUD Office of General Counsel during my 1L Summer, and the experience I had in that office, has informed the remainder of my law school career. After completing that position, I worked on housing policy as a legislative assistant for Pennsylvania State Representative Donna Bullock (D-195), in two internships at the HUD Office of Regional Counsel for Housing Finance and Programs in Philadelphia, and I spent my 2L Summer defending low-income tenants facing eviction at Community Legal Services of Philadelphia in the Landlord-Tenant Housing Unit. Following graduation, I will join the HUD Office of General Counsel Legal Honors Program, where I will continue my work on housing policy at the HUD Office of Regional Counsel for Housing Finance and Programs, here in Philadelphia. In that role, I will build on my knowledge of federal housing law and policy, still aiming to help strengthen communities and work to make our society a little more equal. I do not know where I would be today if not for that March 2016 discussion with Professor Knauer. However, I could not be happier to be where I am, and I am well-prepared to take on what comes next.